The Nest at Finch Rest: Almost Easter! It's just a little over a week till Easter! especially with SNOW coming again soon?!? for all the sad business of saying good-bye. 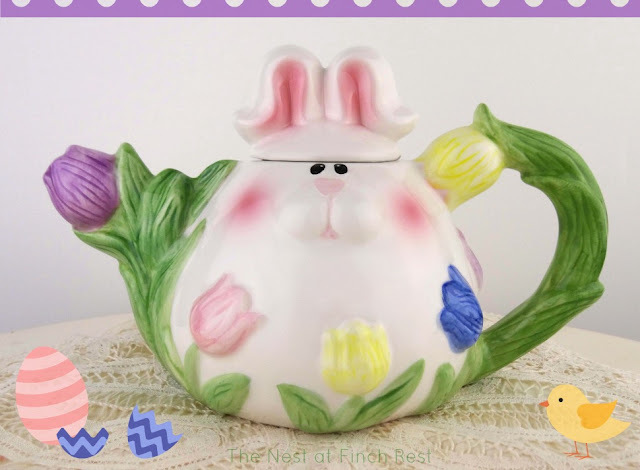 a cute whimsical Easter Bunny teapot. Isn't his little wee pink nose adorable? If you missed my post before this one about my silly kitty, I hope you get the chance to see it. You are in my prayers. Drive carefully and be safe! I am sorry for your family's loss. Much comfort and peace to you all. not match the snowy landscape. Michele, so sorry. Travel safe my friend and my thoughts and prayers will be with you. 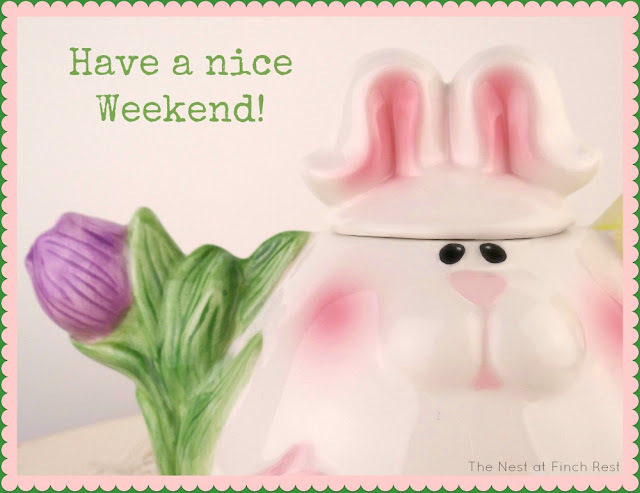 Your bunny teapot is so cute! Oh Michele, I am sorry to hear of your family's loss. I hop the snow isn't a problem for you and your travels. Snow and bunnies? 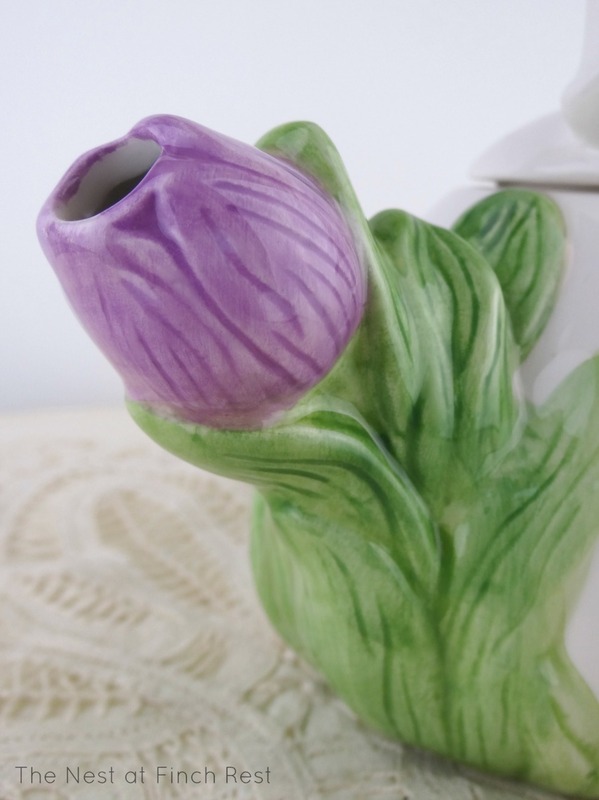 Your teapot is just beautiful and such a cutie. Condolences on your family loss, Michele. Have a safe trip. 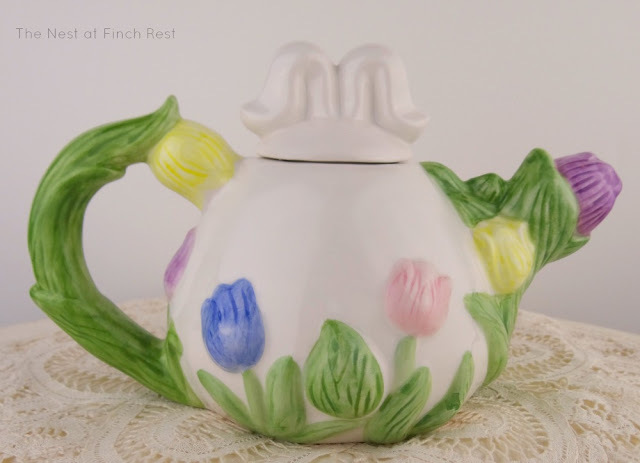 The bunny teapot is adorable...love that the back is decorated too. I'm sorry for your family's loss, Michele. Such a cute teapot for Easter. Hope you miss this "Winter Storm Warning" that is, unbelievably, being talked about. Oh, Michele! I am so sorry for your loss. I am praying for you and your family. This is a cute teapot Michele. My condolences on your loss, drive safely. Wishing you safe travel to your as you remember your uncle. Oh dear, I obviously missed this but I'm glad you apparently made it to the funeral and back OK. So very sorry for your family's loss!